Growing our relationships with our largest investors, both long-time and newcomers. We have recognized the importance of finding new, dedicated investors across the globe. The top four countries investing in Ginnie Mae in 2018, based on estimated value of Ginnie Mae holdings among investors from those nations, were Taiwan, Japan, China and Ireland. Focusing on the intersection of investor and borrower needs, while also protecting taxpayers. Our commitment to this mission led to our decision to sanction a small group of Issuers whose loan performance damaged the integrity of our securities and our ability to effectively serve American homeowners. We have not hesitated to police our program in order to provide the best possible mortgage rate to consumers and a market-predictable MBS to our investors. Monitoring the performance of our security is now part of the routine business of Ginnie Mae, and additional steps can be expected throughout the next year. Responding proactively to the fact that more and more of our Issuers are independent nonbank mortgage lenders. These groups are often efficient at mortgage servicing, but are not subject to federal safety and soundness regulations. This reality requires Ginnie Mae to focus on ensuring the strength and liquidity of our partners and the mortgage market that we serve. To that end, we evolved our approach to counterparty risk management in 2018, and we will take additional steps in 2019 and beyond. As elected officials continue to debate how best to reform the broader U.S. housing market, Ginnie Mae has and will continue to provide insight on the relevant aspects of administering an explicit government guaranty. Meanwhile, in the new year we’ll continue to do our part to ensure that secondary market capital flows to a safe, liquid and accessible residential mortgage market. Read Ginnie Mae’s 2018 Annual Report. To keep pace with the dynamic mortgage market, Ginnie Mae is committed to modernizing its technology in order to deliver a better and safer experience for all participants in the Ginnie Mae program. Advancements already underway to Ginnie Mae’s technology and systems are enabling us to more effectively securitize mortgages, disseminate data, increase efficiency and, ultimately, ensure the stability of Ginnie Mae’s MBS program. In the above video, Ginnie Mae’s EVP and COO Michael Bright and EVP Maren Kasper outline the roadmap for becoming the industry leader in technology and innovation. To further your understanding of how Ginnie Mae is modernizing its platform, read Pillar I of the Ginnie Mae 2020 report. Millions of low- and moderate-income, rural, urban and veteran homeowners rely on loans made possible by Ginnie Mae’s mortgage-backed securities (MBS). Our robust and reliable process for ensuring the timely payment of principal and interest to security holders has enabled us to never miss a payment since our founding in 1968. And over the past 10 years, that business model has been one reason for the tremendous growth we’ve experienced. The charts below illustrate how momentous the past decade has been for Ginnie Mae. 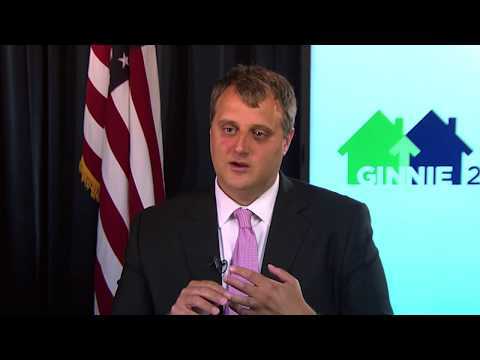 Who Does Ginnie Mae Finance? ​Ginnie Mae finances America. For 50 years Ginnie Mae has brought global capital to the U.S. housing finance market at minimal risk to the U.S. taxpayer. We've provided the liquidity and stability that helps millions of veterans and low- and moderate- income households find affordable homes.